The big bake-palooza (as I like to call it) is this weekend. There’s quite a few coworker and neighbor gifts to make this year, which has me super excited! This year’s packages are going to have some old favorites and new ones too, which I plan on sharing with y’all next week. While this particular recipe won’t be with the gifts this year (since they need to be refrigerated), I wanted to share these truffles with y’all, since this is still a delicious recipe if you’re looking for something to include with your holiday parties. I came up with this recipe for a local recipe contest with the newspaper. I was actually torn between an eggnog inspired dessert and a peppermint bark inspired dessert. This recipe idea won out though, because after asking some friends, it seems like a peppermint bark inspired recipe would be more popular, since quite a few people hate eggnog. Fair enough. The great thing about these truffles is that they come together pretty quickly. It’s definitely an easy dessert recipe to add to your holiday menu! Just keep in mind since the recipe involves cream cheese, these truffles can’t sit out for too long without needing to be refrigerated. They actually taste a lot better cold anyway. With a spatula, whip up the cream cheese to a stirrable consistency. Using a food processor, grind 3 of your candy canes to a powder. Stir the ground candy canes, powdered sugar and ground graham crackers into the cream cheese with a spatula until everything is well-incorporated. Place the last two candy canes in a quart sized plastic ziploc-type bag, and using a heavy bowl, crush up the candy canes into small pieces (not quite a powder, since you want these to add a bit of a crunch to your truffles). Add the candy canes, along with the chopped white chocolate to your cream cheese truffle mixture. Chill the mixture well, for four hours or overnight. When ready to assemble the truffles, divide the mixture into tbsp. sized balls and put the balls on a cookie sheet. By the time you’re done making the truffle balls, the mixture probably warmed up a bit, so place the cheesecake balls in the freezer for 5-10 minutes to firm up. In the meantime, melt your white chocolate for the coating (either in the microwave or with a double boiler). 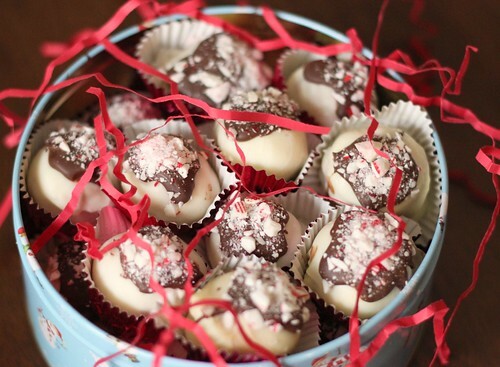 Take your cheesecake balls out of the freezer, and individually dip each ball in the white chocolate mixture. Place the finished dipped balls on a cookie sheet lined with wax paper for the chocolate to set. Once the white chocolate has set, melt your milk or semi-sweet chocolate chips and add a small amount on top of each truffle, along with some crushed candy canes for decoration. Enjoy these cheesecake truffles right out of the refrigerator and keep the truffles cold, since there is cream cheese in the recipe. CONGRATULATIONS! What a wonderful accomplishment for such a terrific recipe. These look so so good! Congrats! Those look so good! Can’t wait to see what you picked out with your winnings. Congrats! Can’t wait to hear about your prize! Eeeks!! How cool are you!! Congrats on your big win, and I bet you got some fabulous for the house – I can’t wait to see what you got! These look sooooooooooo delicious, I wish I could reach right into my computer screen and grab one away!! These make about 25-30 truffles. Hope you enjoy them! I’m so excited for you, congratulations again!! Oh my word! These sound amazing, like melt in your mouth, amazing! These sound amazing! Saw these in CraftZine & had to stop by to check out the recipe.